Re Vera Technologies Pvt. 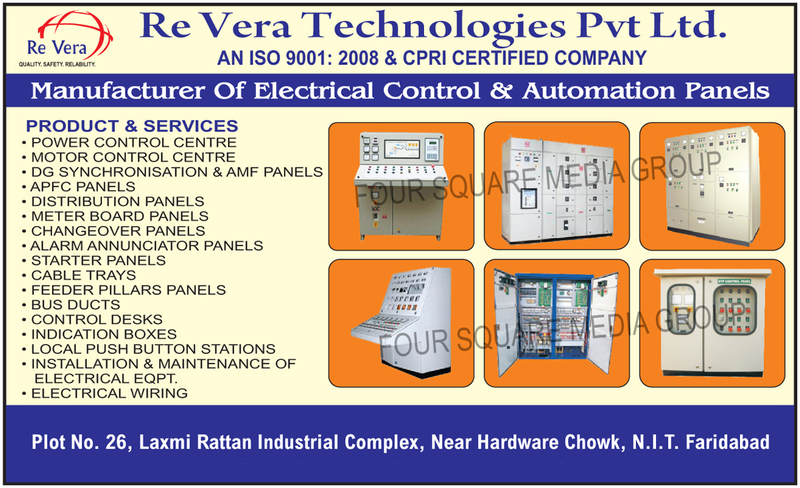 Ltd.
Electrical Control Panels, Automation Panels, Power Control Centres, Motor Control Centres, DG Synchronisation Panels, AMF Panels, APFC Panels, Distribution Panels, Meter Board Panels, Changeover Panels, Alarm Annunciator Panels, Starter Panels, Cable Trays, Feeder Pillar Panels, Bus Ducts, Control Desks, Indication Boxes, Local Push Button Stations, Installation Of Electrical Equipments, Maintenance Of Electrical Equipments, Electrical Wirings, Electrical Equipments Installations, Electrical Equipments Maintenance as an active Manufacturer, Supplier, Dealer, Distributor, Trader and Seller etc. (*Importer/Exporter/Service Provider).